This two-part high-solids urethane varnish is self-leveling and does not require sanding between coats. 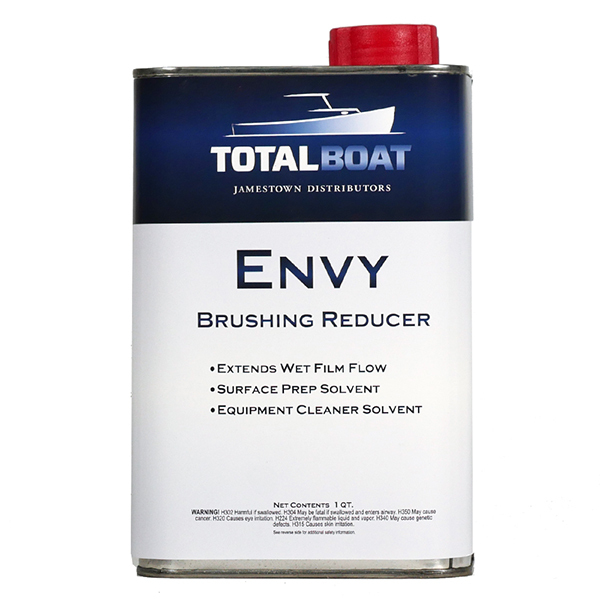 Apply by spray, brush, or roller for an ultra-clear, hard finish with superior UV and chemical resistance. Available in high-gloss and satin. It’s hard to imagine stunning, sparkling-in-the-sun varnished brightwork without an automatic vision of yourself slogging through a month-long marathon of surface preparation, careful application, waiting for the tack-free stage, sanding between coats of varnish, wiping, and recoating. Especially the parts about waiting to recoat and sanding between coats to knock down the highs and make the surface toothy enough for the next coat. Makes your sanding arm sore just thinking about it. 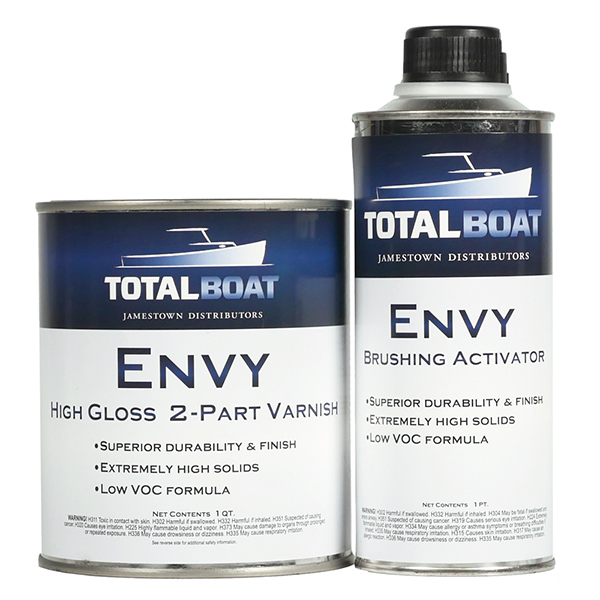 Get more shine in less time with TotalBoat Envy two-part varnish, and wait longer before you have to varnish again. It seals the grain on all types of wood—even hardwoods—and dries fast. So fast you can overcoat after just 45 minutes at 72°F. And with its unique, high-build formula you apply fewer total coats: 4-6, instead of 8-12 (or more), and you don’t need to sand between coats. Envy flows out easily and self levels so there are no highs to knock down or lows to fill in. Best of all, Envy cures ultra-clear to highlight the natural beauty of the wood, and its high solids content creates a rock-hard, durable finish that resists chemicals, abrasion, UV light, and weather better than any 1-part varnish. Which also makes it last longer—up to five times longer. And because it lasts longer, you can go longer without doing maintenance coats. Envy will make you the envy of your neighbors—whether they’re next door at the marina or at home. Envy looks great on exterior wood and trim no matter where the wood is. 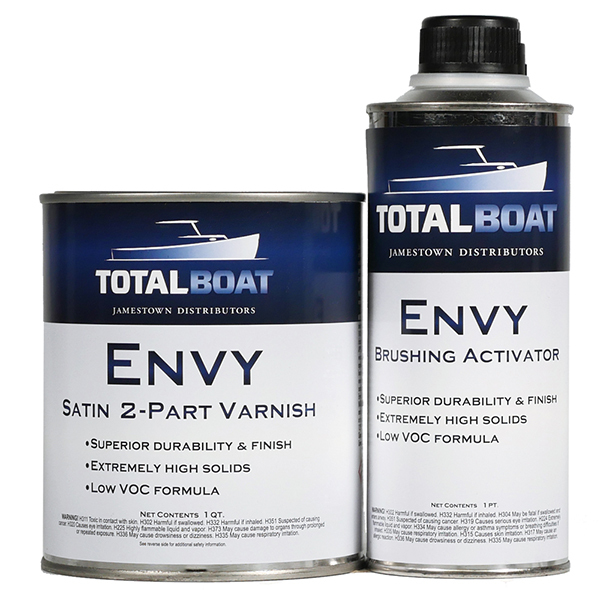 Your neighbors will be green with Envy envy, and you’ll be seeing more green yourself because Envy is less expensive than other two-part marine varnish systems.